JusJotItJan is hosted by Linda G Hill. Prompt word “tingle” suggested by Tessa. Above quote of lyrics from ‘The Fools Who Dream’ by Justin Hurwitz for the film La La Land. Featured image of La La Land scene from Bogo Games on Flickr. This is a film that will make you tingle with happiness for the great art it is. This entry was posted in Blogging, Blogging Community, Film Reviews and tagged #Dreamers, #La La Land, inspiration, JusJoJan, movies on January 11, 2017 by Deborah Drucker. I am out of town this weekend visiting my daughter. Right now I am typing on her MACBook and I am not used to MACs. So that’s my excuse and I’m stickin’ with it. We saw a great movie last night called Queen of Katwe. It has been wonderful spending time with my daughter and we are catching up on a lot of conversation. I love movies and spend a lot of time watching them for entertainment and relaxation. Nowadays we can enjoy films in the privacy of our homes and have the option of large flat screen TVs to watch them on. But there is something special about seeing a film at the theater on a movie screen. The size of the picture and sound, the theater seats, and the tasty bags of popcorn, make it a worthwhile experience. I do like watching films at home as well. It is less expensive and you can watch them more than once and at a convenient time if you have a DVD. I prefer watching films over most television shows. I am so happy that movies were invented and I hope they never go away no matter what type of screen I am watching them on. This is a short post for Stream of Consciousness Saturday hosted by Linda G Hill. Image of movie theater via Wikipedia. This entry was posted in Blogging, Blogging Community, Film Reviews, My Life and tagged Stream of Consciousness Saturday on October 15, 2016 by Deborah Drucker. A classic film I just watched again is Drums Along the Mohawk, (in color), based on the novel by Walter D. Edmonds, starring Henry Fonda and Claudette Colbert about the first pioneer American settlers of the Mohawk Valley in New York State. William Faulkner was an uncredited contributor to the screen play. It takes place during American Revolutionary War times. I was reminded about this film by the blog Cinematically Insane. The restored film was chosen to be among those shown at the 53rd Annual New York Film Festival this year. The settlers have a beef with the British (The Revolutionary War) and some of the Native Americans the British have convinced to fight with them. John Ford is the director. I am a big fan of John Ford movies and the cast is made up of some of his regulars like Ward Bond, Chief John Big Tree, Francis Ford, and Arthur Shields. Edna May Oliver is very funny as the widow Mrs. Mc Klennar. There is a scene where two Seneca braves raid her house and she orders them to carry her bed downstairs before burning down her house. The film is not historically correct in that the Seneca did not raid with the British in the Mohawk Valley. But the British did send in a small force. There is a battle that the local militia men are involved in in the movie which is based on the Battle of Oriskany (1777) which was one of the bloodiest battles of the Revolutionary War. I love the performances of many of these great character actors. I have wanted a copy of the film for a while. After seeing the post about the film’s screening at the festival I decided to order it, and I did. 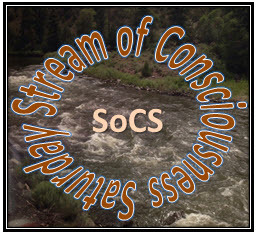 Stream of Consciousness Saturday hosted by Linda G Hill. This entry was posted in Blogging Community, Film Reviews and tagged Blog, Stream of Consciousness Saturday on October 23, 2015 by Deborah Drucker. I remember going to the Saturday matinee at our local movie theater when I was a little girl. We would usually see comedies like Abbott and Costello Meet Frankenstein or a Jerry Lewis movie and eat a lot of candy. Those movies weren’t scary but made me laugh hysterically. I loved the scenes where the monster keeps appearing to Costello and then, when he tells Abbott, the monster has disappeared from sight. The old horror movies were not so funny but would be considered campy and dated today. There were a couple that stuck with me for a long time and in a bad way. These were ” The Fly”, ( 1958), screenplay by James Clavell and “The Tingler” (1959), directed by William Castle. Both had Vincent Price in the cast. He was great in all those old horror films. Which reminds me of “The House on Haunted Hill,” (1959), also directed by William Castle. Now I want to go out and get that one. The others still creep me out too much. What was disturbing about The Fly was how the main character ends up with a fly head, for a head, and then in the end is going to get eaten by a spider. AAAAH! With The Tingler it was that creepy centipede like creature that was supposedly in our spines and the bathtub full of blood with an arm reaching out of it. The centipede creature is supposed to break your spine if you don’t scream. Vincent Price plays the mad pathologist who uses LSD in his research and autopsies executed murderers for the state. I probably shouldn’t have been allowed to watch those movies…. On Samhain, the villagers tell of a stone circle that is in a grove of ancient oaks deep in the forest. There you can see upon old pikes the severed heads of the Cinn Dorcha. They were placed there by the Druid Priestess Aine in the olden times. The heads are covered with rotting flesh, the eyes bulging, and mouths contorted. People swear they can hear them talking to each other when they walk through the grove late at night. I watch over the village near the sacred grove. The people come to me for divinations and interventions with the gods. It is a peaceful time but it has not always been so. It was around this time of Samhain, two years ago, that a dark evil descended on our village. I stood in the sacred grove after the Samhain bonfires. I was in despair about what had come to our land. Darkness was descending. Ta dorchadas a thagann. Ta dorchadas tar eis titum thar ar dtalamh. Cloisim an caoineadh mo mhuintir. Mo mhuintir caoin amach. Ta fulaingt i bhfad. Ta fulaingt i bhfad. The Darkness comes in the form of the Cinn Dorcha, the Dark Ones, and their quest to coerce my people to their ways. Whether it be by tricks or by intimidation. They speak against the old ways and call them evil superstitions. They tell the people that in order to survive they need to reject our old ways and practices. They tell us how we have to dress and how we are to behave as men and women. The women of my country were used to freedom and shared with men equally. The Cinn Dorcha tell us that this is no longer to be allowed. Women who resist this are made their slaves and are abused and violated. They replaced our old holiday celebrations with their own. They destroyed the ancient temple of Tlachtga. Their leader, Olc, labeled our Druid priestesses as witches. The people are afraid and do not know how to fight them. Ni mor dom a cabhru leo. Ni mor dom a cabhru leo! I have been in hiding in the forest. Olc has proclaimed he will give a great price for my capture. I have been able to shield my cottage with a powerful ward. The enemy have searched the forest many times and walked past it only seeing an old burnt out ruin. I began a campaign of harassment against the invaders. I use my shape-shifting ability to become first a falcon strafing them with my talons and next a wolf tearing at their throats. The shape-shifting takes a lot of energy and I am exhausted for days afterward. I was able to blend into the surrounding trees with my cloak and from there I watched them. Olc was with them.They dragged poor Isibeal by a rope that was wound around her neck. Her hands were tightly bound behind her back and her face streaked with dirt and tears. They took her to the stone circle in the sacred grove and tied her to a tree. ” You will join your friend at the stake,” Olc snarled. ” Seize her, seize the witch!” he cried to his men. I raised my arm and called upon the powers of the wind, Thogairm me an ghaoth! A dark cloud blew across the sky covering the sun and the sky turned a metallic grey. The air, cold as ice, circled around the men like a whirlwind. It blew with such force it sounded like the wail of a thousand banshees. The cinn olc were all immobilized with fear. I quickly untied Isibeal and told her to run into the forest. Stepping outside of the stone circle, I raised my arm, and recited the ancient incantation, Teacht chun cinn laochra mor. Scriosann ar naimhde! The ancient oaks in the grove began to sway and moan. With a loud roar the trees released their sharpest branches like spears toward the enemy. The Cinn Dorcha and their leader were impaled where they stood. I raised my arm again and called upon fire, Thogairm me tine! , and an arc of flame shot out from my fingertips setting them all ablaze. They met the fate they had planned for Isibeal. Like the Cinn D’aois in long ago times, I placed the heads of my enemy on pikes at the entrance to the sacred grove. The villagers say that when you walk through the grove in the dark of night you can hear them talking to each other. General Criticism and/or gentle appreciated. This entry was posted in Fiction, Film Reviews, Flash Fiction, Writing and tagged WEP Halloween Challange, Youthful Frights vs Adult Fears on October 20, 2015 by Deborah Drucker. The film Picnic was based on a Pulitzer Prize winning play written by William Inge. It was nominated for Best Picture, Best Director and Best Supporting Actor. This entry was posted in Blogging, Blogging Community, Film Reviews and tagged Blogging, Blogging Community, Movie, Picnic, Stream of Consciousness Saturday on April 18, 2015 by Deborah Drucker. I found my bliss. Ollie Hofnoodle’s Haven of Bliss that is. If you have seen A Christmas Story by Jean Shepard this is another film written by him that is very funny. What I love about it is that is epitomizes an era in American life of the middle class family. This is about Ralphie and his family when he is a teenager looking for his first job. His father still has his nose to the grindstone and wants nothing more than to get away for his annual 2 week summer vacation at a resort on Clear Lake. There are hilarious parts about Ralph’s first job, how the family dog “Fuzzhead” runs away, and the “epic car trip” on the way to the lake. Their family car is loaded up to the roof with all the comforts of home they want to bring to the vacation cabin. This was when a family typically had one family car. Shepard describes the mother’s lot in life, quite accurately I thought, when he says she never got to taste her food warm because she was constantly waiting on the rest of the family during mealtime. There is one scene where the family is on the road and they recall how when then got to a certain place there was this bee that would come into the car and harass them. They wonder if the bee could still be there. The father says that’s ridiculous. Well, you guessed it, the bee shows up and the next scene is the whole family running down the road. This entry was posted in Blogging, Film Reviews and tagged Blogging, Films, humor, Ollie Hofnoodle's Haven of Bliss on March 23, 2015 by Deborah Drucker.